Introducing our new, all-inclusive tennis holiday in Belek, Turkey. Staying at the 5-star Cornelia Diamond where a week of sun, tennis and relaxation awaits, and with 8 clay courts just a short stroll away - it truly is a tennis player's Turkish delight! A perfect base for our tennis week, the superb 5-star Cornelia Diamond Resort is well-established as a firm favourite with UK guests travelling to Turkey, and is regarded as one of the top resorts in Belek. We stay on an all-inclusive basis, which means we can make the most of fantastic facilities on offer and enjoy the service and hospitality for which the hotel is renowned. We have included 5 days of tennis on clay courts. Located just a short walk away from the complex, these are sure to be great bases for our sociable tennis week of friendly matches. This holiday is suitable for all experienced tennis players that play regularly at home, and are not intended for beginners. Take time off from the courts; relax and enjoy the hotel’s facilities; or if you're feeling energetic try your hand on one of Belek’s wonderful golf courses, including our hotel’s onsite course designed by the legendary Nick Faldo! 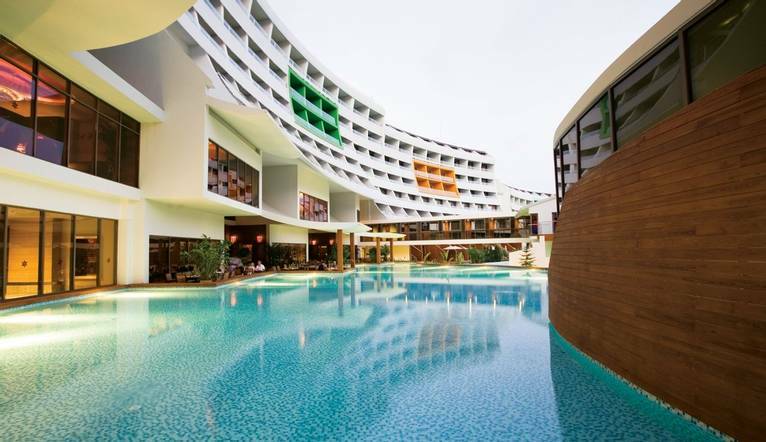 The Cornelia Diamond Golf Resort is an elegant and luxurious 5-star hotel located 2km from the resort centre of Belek. There’s an endless range of things to do, from playing on the Nick Faldo golf course next door, relaxing in the spa, or enjoying a fantastic meal in one of the a la carte restaurants. The hotel's facilities include its 27-hole Nick Faldo designed golf course, a beach, outdoor and indoor pools, a daily activity programme, full sized fitness centre, whirlpool, sauna, Turkish bath, three a la carte restaurants, internet café and spa centre. Rooms have a double or twin bed and include air conditioning, flat screen television, safe, Wi-Fi, hair dryer and balcony. The transfer from Antalya airport to the hotel is approximately 30 minutes, depending on weather and traffic. We include a 5-day programme of organised tennis, with our Solo's Tour Leader organising the friendly competitions. Don’t forget to pack your tennis racquet! Either tennis or casual attire during the day. Proper tennis footwear is of course required when on court. Smart casual clothes will be ideal for the evening. Please note that shorts should not be worn for evening meals. Appropriate comfortable shoes are a must for sightseeing. Listed below are a few of the tours which will be on offer to you. All Tours should be paid for in Euros only. Please note that prices shown may vary according to numbers. Full details will be given at your Information Meeting. The exact amount will be given at your Information Meeting. Your Tour Leader will help arrange these for you but may not necessarily accompany you.